6022 43AbDDII 6 Pfg. 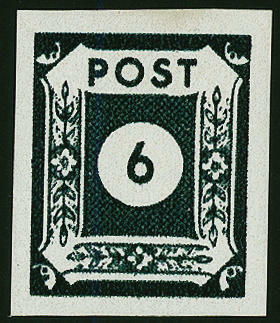 Black blue green, vertical strip of four, third stamp with scarce \"part double pressure\", the lower values with full centerpiece, in perfect condition mint never hinged these partial double prints are through miss respectively to arrest the printing machine during of the printing process originated. The unit possesses an upper- and lower margin. 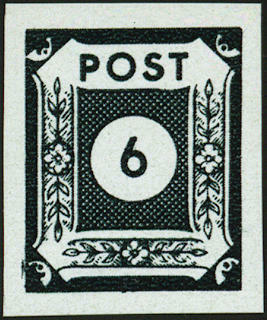 All stamps are fresh colors and with wide margins with original gumming, slight affixed spots. A significant rarity of this area! Photo expertize Ströh BPP. 6023 43Ac 6 Pfg. Greenish black, extremely deep colored, wonderful fresh colors and large margins all around in utterly perfect condition. An especially nice copy this sought-after and rarely issue, photo expertize \"genuine and immaculate\" Ströh BPP. 6024 ✉ 43Ac 6 Pfg. Greenish black, the scarce color variety, wonderful fresh colors, large margins all around in perfect condition with attractive additional franking on very nice, almost correctly franked registered local letter from \"DRESDEN 11.2.46\", a wonderful document this so rarely and nearly always missing colour, photo certificates Zierer BPP, Ströh BPP. 6025 43Ac,AcI,AbDDI 6 Pfg. 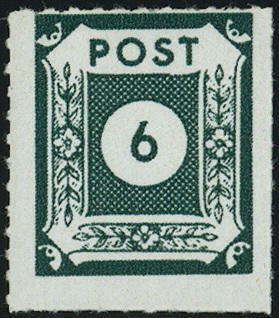 Numerals in the vertical strip of three from lower margin, the upper stamp in the color error \"green black\", the middle stamp showing a double print \"green black on black blue green\" and the lower stamp in \"black green with part double pressure and full centerpiece\" fresh colors and with wide margins, in perfect condition mint never hinged, unfolded in utterly perfect condition. A spectacular Soviet Zone rarity, the same three rarities inside the unit combined! Photo copy of a certificate \"genuine and immaculate\" Ströh BPP. Michel 10000,- €. 6026 43AcI 6 Pfg. 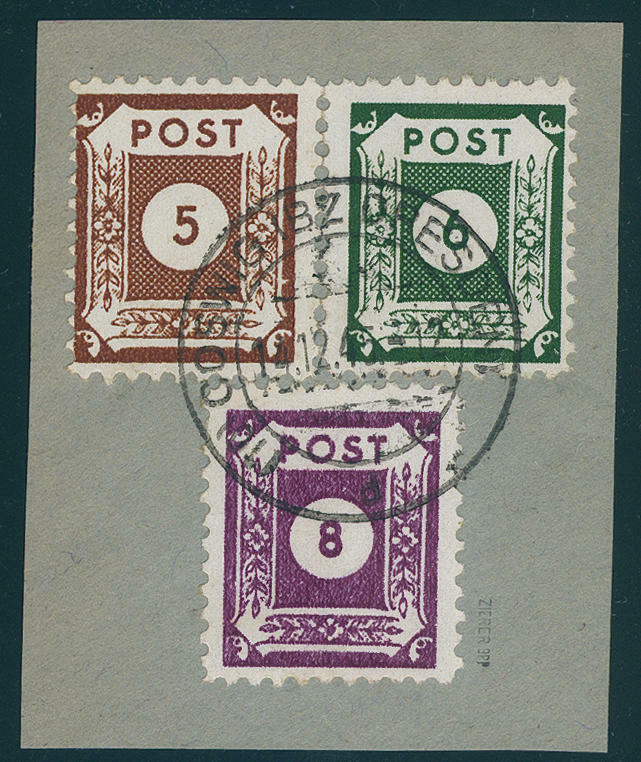 Greenish black, the scarce color variety with full centerpiece, fresh colors and with wide margins, in perfect condition mint never hinged there are only few examples from this known. Photo expertize \"genuine and immaculate\" Ströh BPP. Michel 3500,- €. 6027 43bG 6 Pfg. 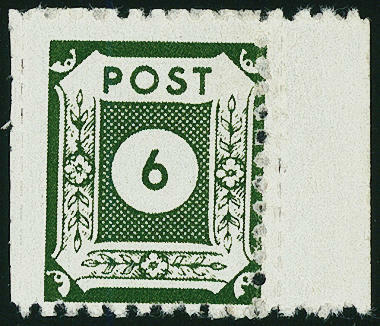 Black blue green, the very scarce colour, with linear roulette 9 1 / 2-11 from post office Loschwitz, wonderful fresh colors, in perfect condition mint never hinged a sought stamp in perfect condition! Photo expertize \"genuine and immaculate\" Ströh BPP. 6028 43BIIa/DI 6 Pfg. 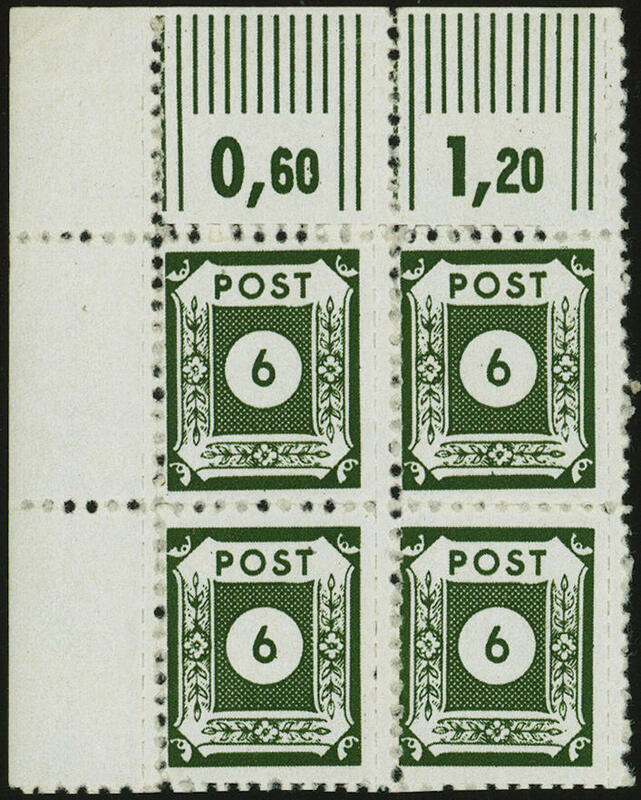 Black yellow green with official line rouletted 10 of the Regional Directorate of Posts Dresden and with additional retroactive lines perforation 10 from post office Coswig, corner margin block of four top left, wonderful fresh colors and in perfect condition mint never hinged already single is these stamp extremely rare, in this kind as corner margin block of four probable unique and one of the large SBZ-rarity! Photo expertize \"genuine and immaculate\" Ströh BPP. 6029 43BIIa/DI 6 Pfg. Black yellow green with official line rouletted 10 of the first issue of the Regional Directorate of Posts Dresden and additional lines perforation 10 by which post office Coswig, fresh colors and in perfect condition mint never hinged, from right margin of sheet. A SBZ-rarity! Photo expertize \"genuine and immaculate\" Ströh BPP. 6030 ✉ 43C 6 Pfg. Black blue green with official experimental perforation 11, in perfect condition as correctly franked single franking on commercially related postcard from \"blaze ERBISDORF 13.8.45. 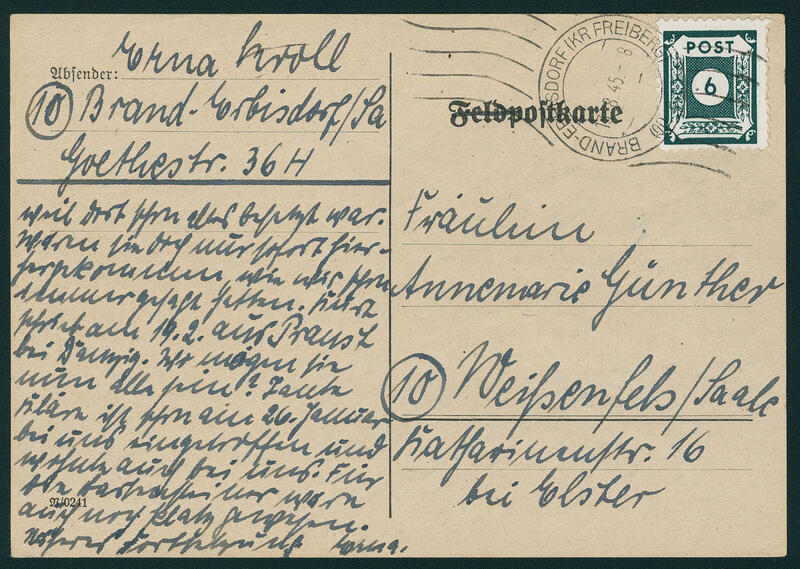 \" to Weissenfels / Saale with detailed text. Legitimate postage of this issue counts to the SBZ-rarities! Photo expertize \"genuine and immaculate\" Ströh BPP. 6031 ⊙ 44aGI 8 Pfg. 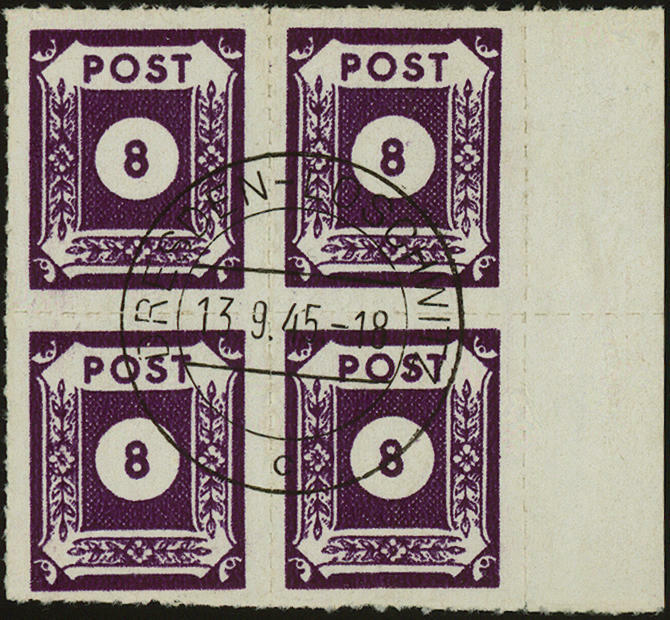 Brown violet, full centerpieces, block of four from right margin of sheet with line rouletted 9 1 / 2-11 from post office Loschwitz, wonderful fresh colors, in perfect condition centric and neat cancelled \"DRESDEN-LOSCHWITZ 13.9.45\". A decorative unit with of this variety! Expertized. Ströh BPP. Michel 400,- €. 6032 ∆ 44DIc 8 Pfg. 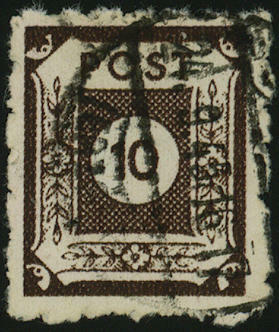 Bright gray violet, postmaster perforation from Coswig L10, the good colour with additional franking 5 Pfg., 10 Pfg. On very nice letter piece, centric cancellation \"COSWIG 14.12.45. \", an exception copy, expertized Ströh BPP. 6033 ✉ 45,48bDIIIUMs 10 Pfg. Dark sienna and 20 Pfg. 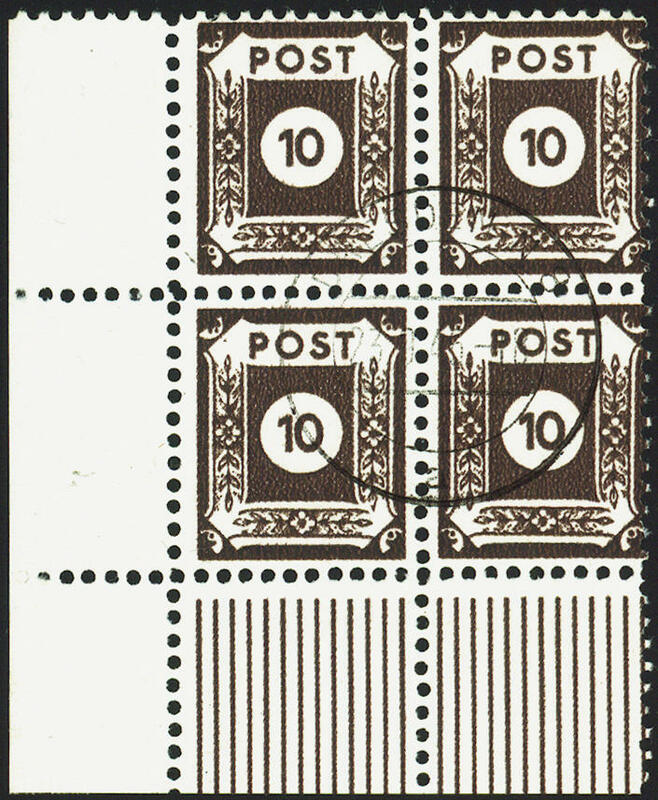 Blue-grey in horizontal pairs with lines perforation 11 ½ from post office Coswig, both in the middle unperforated, with additional franking on very nice, correctly franked registered cover from \"PIRNA 2.5.45. 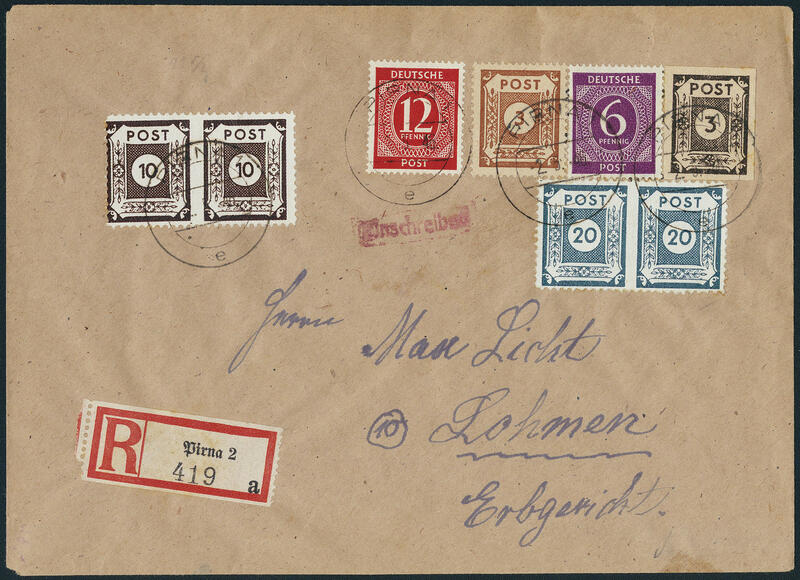 \" to Lohmen with arrival postmark. Covers of this kind to class among the SBZ-rarities! Photo expertize \"genuine and immaculate\" Ströh BPP. 6034 45AZS 10 Pfg. 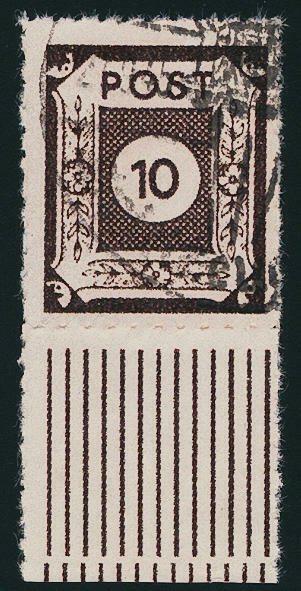 Numeral, vertical pair with gutter from left margin of sheet with figure of value of rows, fresh colors and large margins all around, in perfect condition mint never hinged, as usual manufactured hinge trace in the gutter, since the large sheet was folded here. This is one of the very important SBZ rarities, as only one other specimen of it has become known. The here offered copy comes from the Ströh collection and was on of our 70. Auction for 3600,- €plus percentage of bid price auctioned. One of the most important SBZ-rarity! Photo expertize \"genuine and immaculate\" Ströh BPP. 6035 ⊙ 45DI/I 10 Pfg. 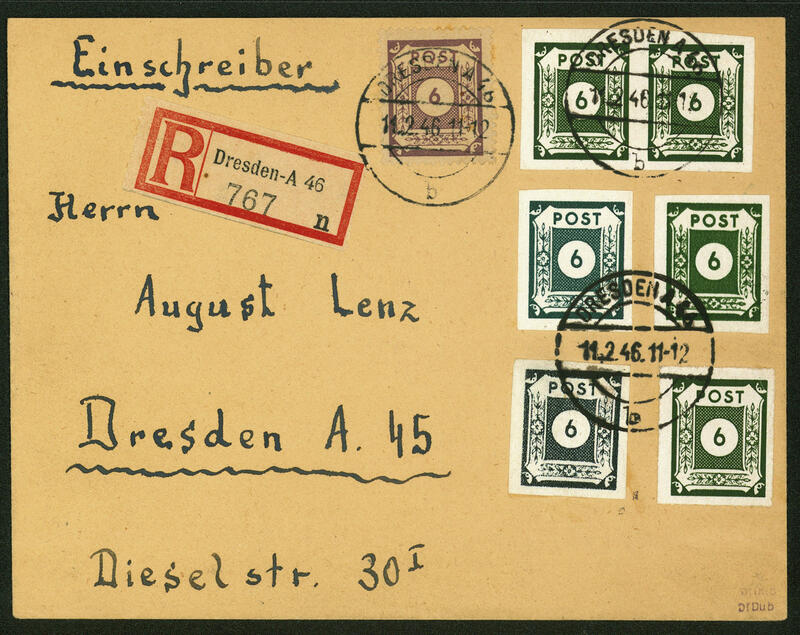 Dark sienna, block of four from the left lower corner of the sheet, as well all stamps with full centerpieces, with lines perforation 10 from post office Coswig, wonderful fresh colors, in perfect condition centric cancellation \"DRESDEN 23.9.45\". An extremely decorative and very scarce unit with of this variety! Photo expertize \"genuine and immaculate\" Ströh BPP. 6036 45L 10 Pfg. Dark sienna, linear roulette 9 3 / 4 - 10 from post office Seiffen, vertical pair from lower margin, fresh colors and in perfect condition mint never hinged already single stamps are mint never hinged extremely rare, in this kind as unit a significant Soviet Zone rarity! Photo expertize \"genuine and immaculate\" Ströh BPP. Michel 5000,- €. 6037 ⊙ 45L 10 Pfg. 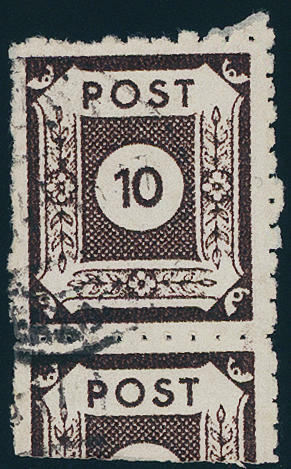 Dark sienna with linear roulette 9 3 / 4-10 from post office Seiffen, fresh colors and neat cancelled, at the bottom with attaching part of the neighbour, rare stamp, photo expertize \"genuine and immaculate\" Ströh BPP. Michel 1500,- €. 6038 ⊙ 45L 10 Pfg. Dark sienna with linear roulette 9 3 / 4 - 10 from post office Seiffen, in perfect condition from lower margin with special cancellation \"SEIFFEN 21.9.45. \", photo expertize \"genuine and immaculate\" Ströh BPP. Michel 1500,- €. 6039 ⊙ 45M 10 Pfg. Dark sienna with sewing roulette from post office Seiffen, wonderful fresh colors, neat cancelled \"SEIFFEN 24.9.45\", rare, photo expertize \"genuine and immaculate\" Ströh BPP. 6040 ✉ 46Aa 12 Pfg. 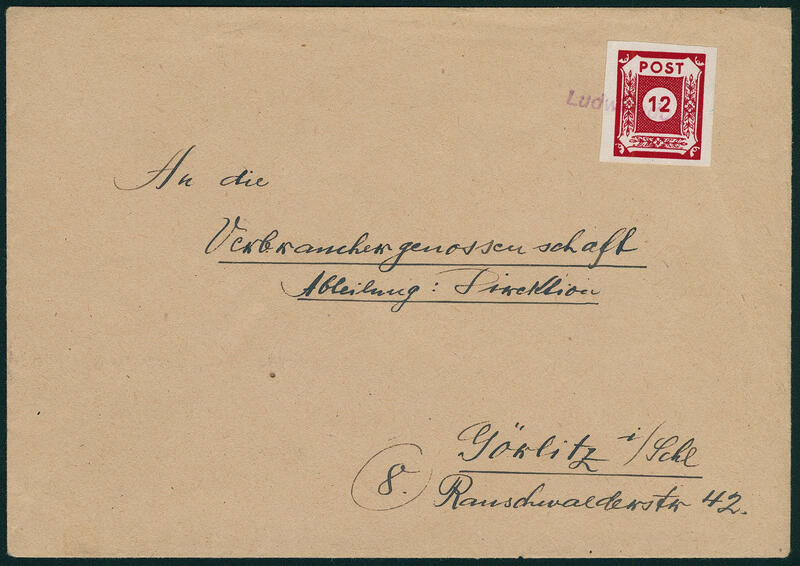 Red, fresh colors and with wide margins as faultless single franking on cover with very scarce provisional cancel \"LUDWIGSDORF\" to Görlitz transported. Covers of this kind to class among the SBZ-rarities. Photo expertize \"genuine and immaculate\" Ströh BPP. 6041 ✉ 46Aa 12 Pfg. Red, fresh colors and with wide margins from lower margin, in perfect condition as correctly franked single franking on beautiful commercial letter with two ring cancel \"HEIDENAU Country 25.7.45. 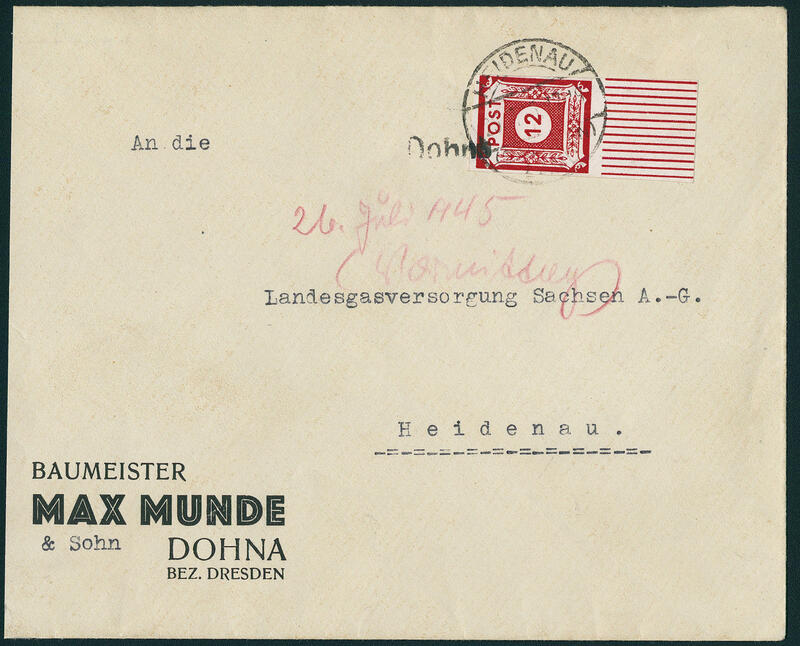 \" and very scarce provisional cancel \"DOHNA\" to Heidenau. There are very few documents from this known. A Soviet Zone rarity! Photo expertize \"genuine and immaculate\" Ströh BPP.